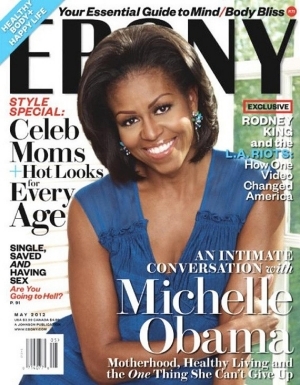 A couple nights ago, the Hubs brought home this month's issue of Ebony magazine, with none other than First Lady Michelle Obama gracing the cover. It is no secret that I think she is the most amazing First Lady we've had since I can remember. She shines of grace and poise inside and out. I flipped straight to her article and it was all about her healthy living habits and initiative on childhood obesity, Let's Move. After reading, it made me love her more. I realized that everyone goes through the same struggles, even the First Lady and all her perfection. You just have to know how to cut back on the small things and it will produce big changes. Here is a little bit of information on Let's Move. I love the last line of the interview. "You just don't wake up one morning and not love pie." Amen to that!!!! Saw your comment on cheetah is the new black, wanted to let you know that there are some great floral pants/shorts in forever 21's plus size section you should check it out! I would also bet that asos.com has some as well. Hope this helps!